With unveil of Aston Martin Vulcan 2016 at the 2015 Geneva Motor Show race models like Vantage are surprised. Reason isn't just the enthralling specifications but hearing the same from Aston Martin turned to be one. About Aston Martin news claimed of it going through a financial crisis and was facing a tough time to survive. And at such a crucial moment coming with a track oriented version like this called in for competition models like, Ferrari FXX K and McLaren P1 GTR. This is for the first time that the company has came up with its very own racing program and uniqueness beholden which till date only Ferrari did. 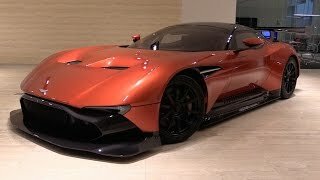 Let us check more about the Aston Martin Vulcan 2016 and see its specifications and features integrated. 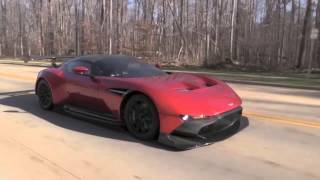 The interior of Aston Martin Vulcan 2016 to a lot extent holds work of carbon fiber. Each and every fixation is done keeping in mind the racing instinct, by each and every thing we include, the dashboard, and instrument display cluster till its seats. This model in particular, the Vulcan 2016 by Aston Martin is a commendable result portraying dedication and knowledge of the team. The black and carbon-fiber work all across the interior gets blessed with the orange stripe and red buttons on center console, giving the Vulcan more sporty and catchy look. The instrument panel holds all vital information with it which the drier might need for safer and better ride, this includes, speed, tire pressure and lap time in major. 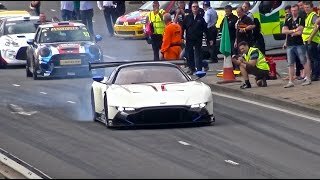 The exterior of Aston Martin Vulcan 2016 holds a major contribution from the racing models of Vantage cars. Both the LED headlamps and the grille are mounted at a new location. The grille indeed gets a separation by a bare carbon-piece incorporating the splitter. Though reshaped but fenders hold the trademark Aston Martin vent. Talking about the rear fascia it’s an entire new design noticeable, apart from the taillights, side vents and wings, rest all is new work of engineering. 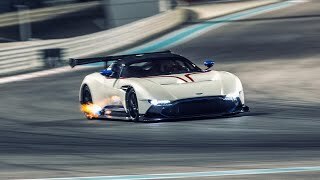 In all entire exterior is made from lightweight material in turn making the Vulcan 2016 the Aston Martin’s lightest model till date. 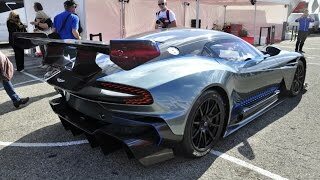 This is the segment which deserves unbeatable accolades by Aston Martin in making this all new Vulcan 2016. The standard 5.9 liter displacement switches to a massive unmatched 7.0 liter with its V12 engine distributing the mega power of 800 hp mated to six speed sequential transmission with paddles behind the steering wheel for better control and ride.